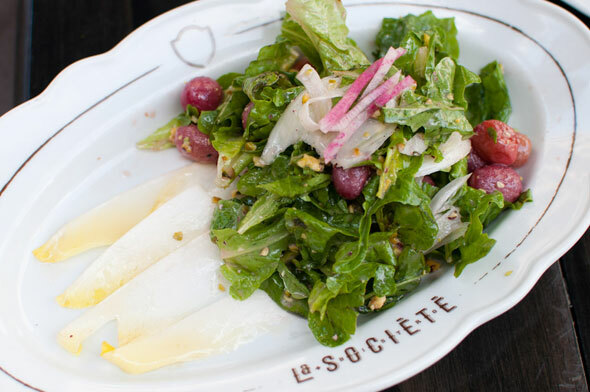 La Societe opened near Bloor and University back in June 2011. The name of the French bistro ensured it was no secret that Charles Khabouth - "King of clubs turned Emporer of hospitality" whose company INK owns venues the likes of This is London , Guvernment / Kool House and CUBE - was hoping to create the Cheers of Toronto's high society. 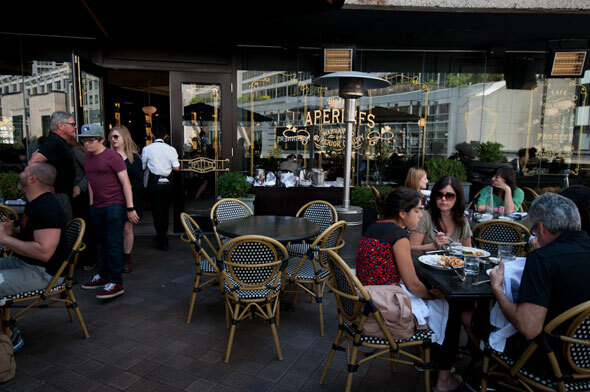 It could now be argued that this is the place where Toronto A-listers go for after-work drinks and birthday dinners. Bankers and Yorkville locals meet at their regular booths with wannabee fashionistas looking in. Or so the story goes. Not exactly the setting for brunch on a sleepy Sunday. While there was a short queue for a table on the upstairs patio (the street-level patio was closed) inside was all but empty. 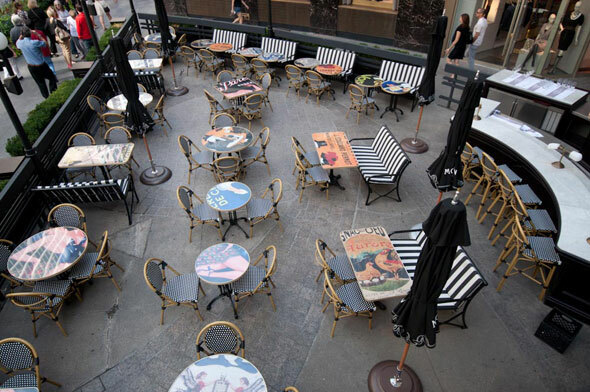 Diners were a mix of international tourists, out-of-town shoppers, and Tiffany clad girlfriends, with Yves Saint Laurent and Hermes bags dotting the backs of chairs. No celebrities in sight. As a party of two we were sat immediately. A server was at our table within an instant to ask our preference for sparkling, still or tap water (how French!). Prices weren't overwhelming, considering the neighbourhood , still we decided to opt for the classic over the P.E.I. lobster benedict ($24) (though later we found ourselves regretting this decision when we saw the dish served to a nearby table). To start, we opted for the grape salad. The flavours simply did not mix. Too tart. Now, you might assume that pulling out a camera or a notebook at a restaurant would put the staff on their toes. This is why many reviews are done discreetly (and published without accompanying photos), namely to ensure service can be judged as usual. But, camera or not, I've come to learn quality of service is rarely affected. Could it be the plethora of food blogs out there? The fact that so many tourists log where they eat? Either way, bad service continues regardless. Enter Assistant General Manager Blair Cowan, in himself justifying Khabouth's reputation for above and beyond hospitality. Within seconds of snapping the above photograph, he was over my shoulder inquiring as to the purpose of our visit - a seemingly natural response, but surprisingly rare. 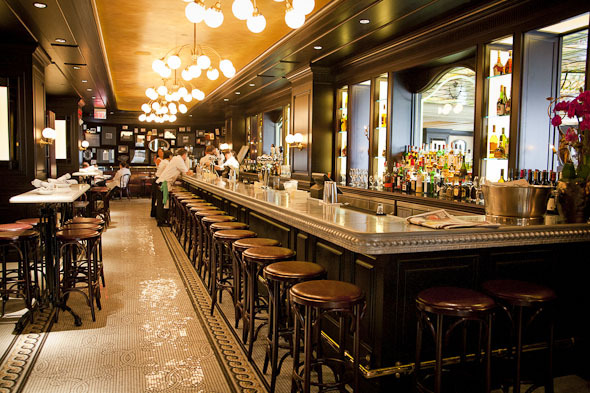 Clearly passionate about the success of the bistro, Cowan shared that he had been invited to work at Khabouth's latest venture, the King Street saloon-styled Weslodge , but turned it down in order to watch over La Societe's growing success. Without ever being invasive he made a presence at every table, disseminating a jovial demeanor down through the staff. Back to the food. 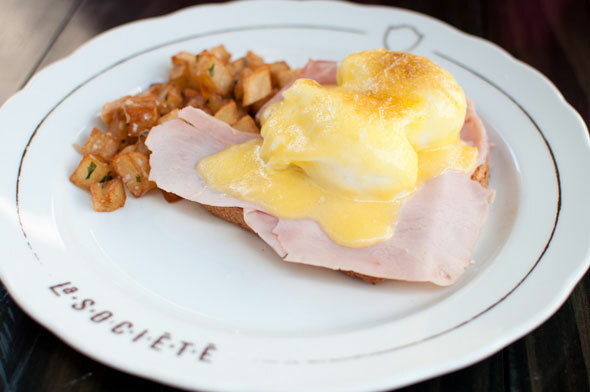 The Societe benedict, with westphalian ham, toasted brioche, poached egges, and potato hash - the hollandaise was light while still creamy, and most importantly came out hot; the home fries were simple but salted more than usual, just to our liking. A rare occasion when such a decadent dish did not leave us regretting the indulgence (though we could have done with double a portion of home fries that without a doubt would have put us over the edge). As per usual, I ordered the French toast, a sandwich of thick and chewy bread stuffed with chocolate nougat, then dusted in icing sugar and topped with a banana puree, served with a side of berries and whip cream. When the plate arrived the first thing that came to mind was the fact that the dish was served without maple syrup. Before I could take the first bite Cowan had brought some over. Although the chocolate was locked somewhere in the centre, beyond a wall of thick crust, the caramelized bananas made up for any lack of sweetness. The dish passes much more as a desert than it does a wholesome breakfast. 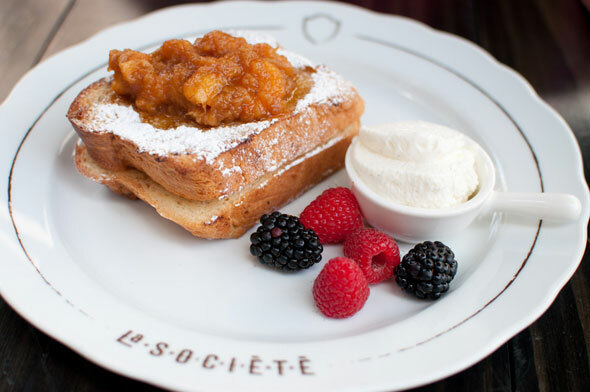 The food is not what draws people back to La Societe. Not that we expected larger portion size based on price considering Yorkville standards. But taste was just at par. There was nothing exceptional about the dishes. Instead, the decor is why I've been sending people to check out what many would overlook as a pretentious establishment. 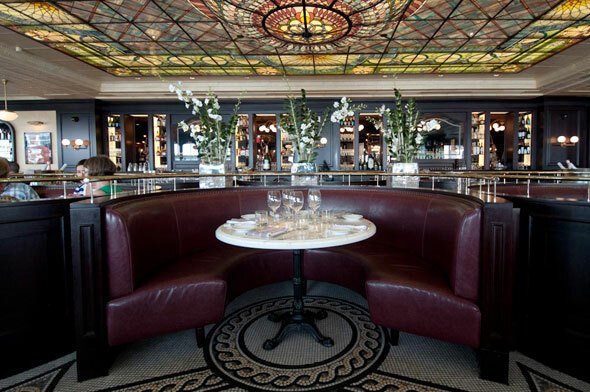 The stained glass ceiling that umbrellas the cafeteria-sized dining area; a bar worthy of PJ Clarke's ; having lived in Paris for a year it sent chills up my spine.